This gadget is like having an extra pair of hands. It makes it so much easier and tidier to fill plastic bags. 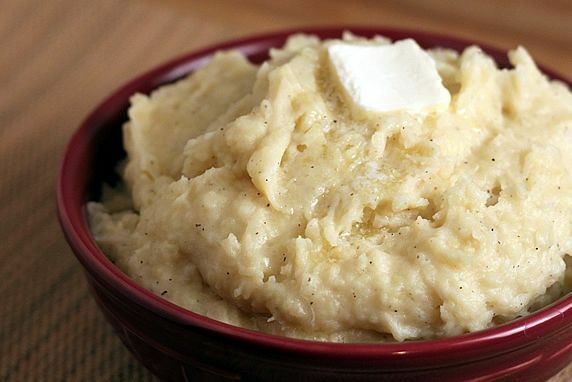 In a previous post I shared my recipe for Slower Cooker Mashed Potatoes. That recipe uses 5 pounds of potatoes, and I often have leftovers when I make it. Sometimes I make soup with the leftovers, but usually I freeze them so that I can easily reheat them for another meal in the future. Some people don't like to freeze potatoes, because their texture may change when they're thawed. That is more likely to be a problem with higher starch potatoes like russets. But, even with those, I've found with a small amount of doctoring frozen mashed potatoes can be thawed, reheated and restored for a tasty side dish. I freeze mashed potatoes in two ways. Use a measuring cup or large scoop to measure even portions onto a parchment paper lined baking sheet. I make mine in 1/2 cup portions. 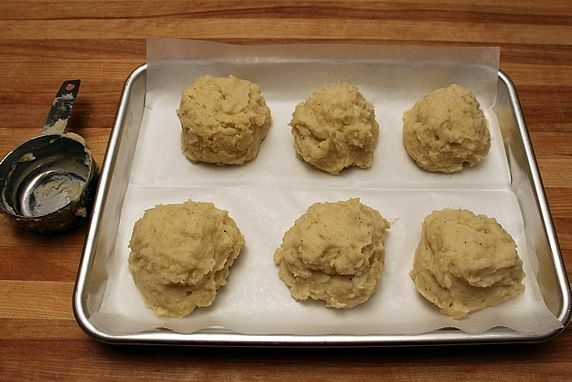 Put the baking sheet in the freezer for several hours or overnight until the potatoes have frozen hard. 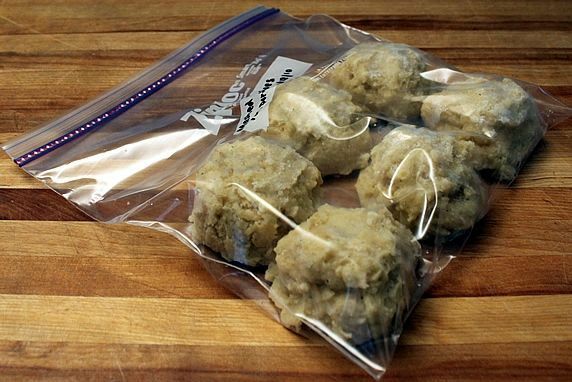 It's easy to transfer the frozen portions into a freezer ziploc bag. Date the bag and label it with the portion size. That way you can easily grab however many you need to thaw in the future. These will keep in the freezer for at least 2 months. 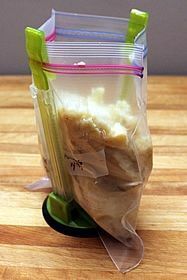 Measure mashed potatoes into ziploc freezer bags. I prefer to use quart size bags and fill them with 1-1/2 to 2 cups of mashed potatoes. 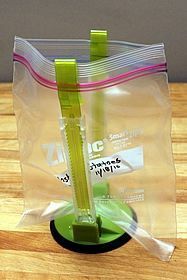 I use one of these handy Baggy Racks to hold the bags open while I fill them. 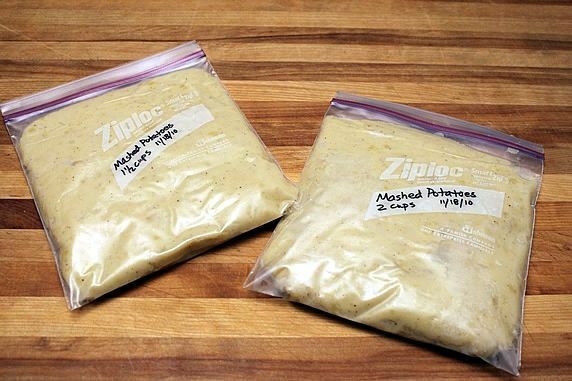 Label the ziplocs with the amount of mashed potatoes inside. Flatten them and get out as much air as possible before sealing them. 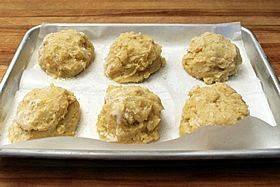 Freeze them flat until they are hard; then they can be stacked in the freezer. They also thaw faster and more evenly when they are frozen flat and thin like this. Put them in a covered bowl and heat them in the microwave at 50% power for approx. 5 minutes, stirring occasionally. (Microwaves vary, so you may need to adapt the cooking time.) Once they're hot, stir them well. 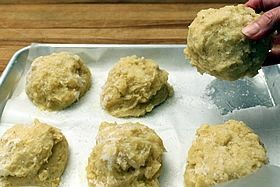 If they are too watery, stir in 1-2 tablespoons of sour cream or cream cheese per 2 cups of potatoes. This will thicken them and restore a more creamy consistency. I don't find this to be as necessary with Yukon golds, but it is for starchier potatoes like russets. 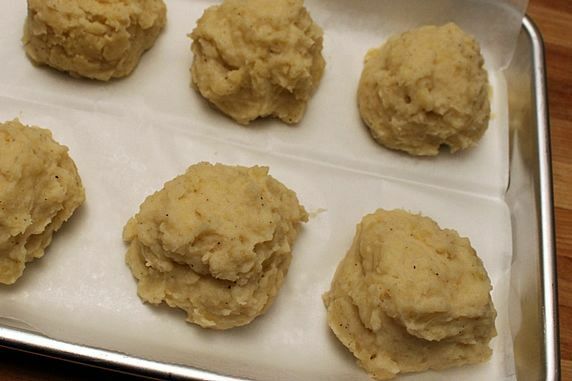 Using this freezing, thawing, and reheating method, you can cook a big batch of mashed potatoes and enjoy them for several meals.